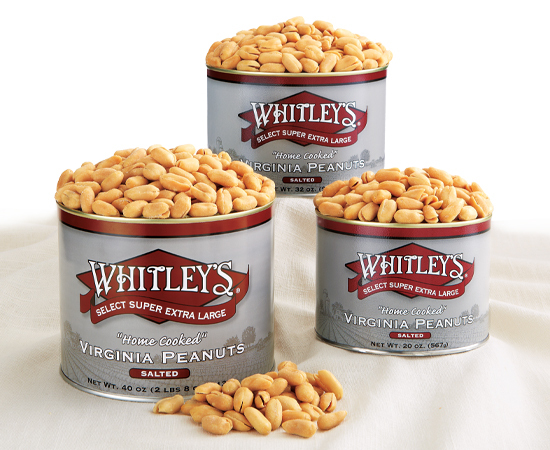 In 1986, with only one small batch roaster and three employees cooking peanuts, Marion Smith and his son Craig opened the doors to Whitley's Peanut Factory, which still stands as a retail store off Route 17 in Gloucester, VA. Due to high demand, they soon opened a second location in Williamsburg, VA, and a new production facility in Hayes, VA. This past year, Whitley's opened a third location in Richmond, VA and a second Distribution Center in Gloucester County, that gave them an additional 10,000 sq. feet. Thirty-three years and millions of peanuts later, Whitley's Peanut Factory has become a local staple for "Home-Cooked" Virginia peanuts and peanut confections. Todd Smith, now president, continues his family's legacy of cooking Virginia peanuts to golden perfection. because our peanuts are still made the old-fashioned way slowly hand cooked to perfection. We choose only the highest quality, super extra-large Virginia peanuts which are hand selected for their size and freshness. Each batch is individually cooked with proven, traditional recipes to ensure the crisp, fresh flavor and unique taste for which our peanuts are famous. We are very proud to have been selected by the National Association for Specialty Food Trade as a Finalist in the Outstanding Hors D'oeuvres or Snack Food category. We offer you only the finest products available and we combine our fine quality with good, quick service. We are proud to have been selected as a member of the Virginia's Finest program, which supports and promotes Virginia manufactured products. The display of Virginia's Finest logo on our packaging confirms our status as producers of some of the finest quality products Virginia has to offer. Whitley's Peanut Factory's products are consistently manufactured safely. The facilities are operated under FDA regulations and the appropriate modules from the Safe Quality Food Institute's Code (SQF). The code is a HACCP-based Food Safety Program that is audited internally and independently audited by a 3rd party company. We have Food Safety Plans for each of our products. Whitley's maintains prerequisite programs like Good Manufacturing Practices, Document Control, Pest Control, Allergen Controls, Sanitation, Employee Training, and many others. We also perform sensory evaluations on each of the products to make sure our customers are getting the product they know and love. Our quality assurance program includes staying up-to-date on all relevant recalls, market withdrawals, and safety alerts published by the FDA and even around the world. Each employee at Whitley's knows how important it is to keep our customers happy and meet or exceed their requirements and expectations and comply with regulatory standards. We strive to make the best possible product we can make daily! 1. Our products are handmade. Yes, we cook our peanuts by hand and hand dip all of our peanut clusters one at a time with care and attention. 2. Our peanuts are cooked to perfection. Although some things in life aren't perfect, we do our best to make sure each batch is made with the highest quality ingredients and we take our time cooking our peanuts to ensure a crisp, crunchy, and tasty flavor. 3. Our company has been family owned since 1986. Just like our family, we make sure we take care of our customers and community because we truly care about the people we serve. 4. Support small business. Our communities are filled with small businesses that are committed to customer service because without it we wouldn't survive. We work endlessly from the moment we come up with a new product idea, refining the product, cooking it, packaging it, to selling it in our store or online to ensure we provide our very best product to you. There is so much that goes into it and we enjoy every part of it with the hope that our customers will be happy when they taste our products. 5. Quality guaranteed. Not satisfied with our performance? We will make it up to you. We want you to enjoy our products and if you're not happy with your purchase for any reason, please return the merchandise within 15 days and we will make it up to you! We are humans you know.